I’m a huge fan of to-do apps. I rely heavily on task lists to manage my work and even much of my life in general. Todo for iPad is the first task manager app that has really caught my eye in quite a while, as I already have a solution that works very well for me in this area (Things). I liked the look and sound of the app so much when I saw its iPad version released, that I’ve been trying it out for a couple of days. The UI isn’t just pretty though – it’s very easy and comfortable to work with. 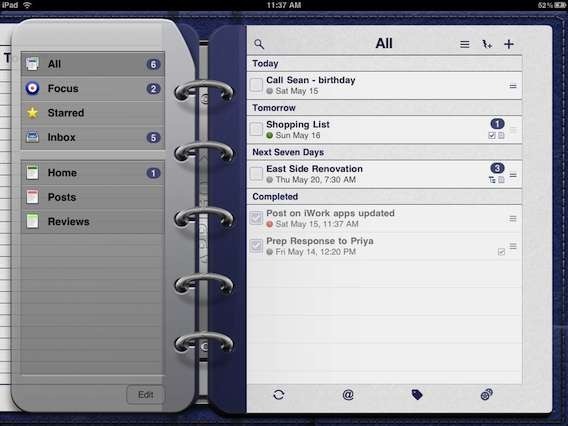 ✔ Real Planner-like Interface Built for iPad! — It’s easy to create a normal (single) task or a checklist or project task very quickly. The checklist and project types are especially useful and nicely done. — It looks great in landscape and portrait and is nice to work with. 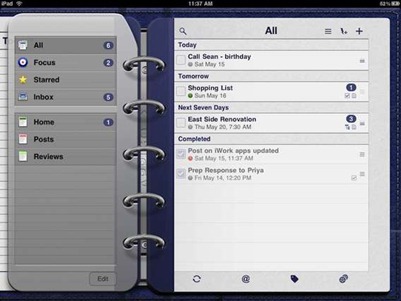 If you’re looking for a good to-do / tasks app for the iPad or iPhone, Todo is well worth considering. It’s got a great UI, a very strong set of features, and good sync options. I won’t be switching to it – as I have a lot of time and money invested in Things on the Mac, the iPhone, and iPad. I’m used to working with it, and it suits my style of working well. I also prefer having a full desktop app as a sync partner, rather than Outlook (which I don’t use) or iCal as Todo offers. But I enjoyed trying out Todo and think it will be a killer app for lots of users. It is also priced very attractively right now, at just $4.99 as a ‘launch sale’. If you’re interested, you may want to check it out soon, before that price goes up. 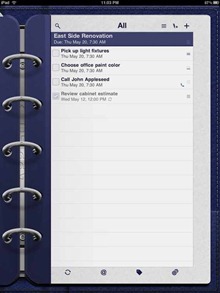 You can find Todo for iPad in the App Store now. *** This app was independently purchased by the post author in the App Store. For further information regarding our site’s review policies, please see the "About" page. I just downloaded it for my iPad, I also downloaded Toodledo for iPad. I use Appigio sync on my iMac and Busycal for my calendar. I am having a lot of difficulties. I can't get the Appigio sync to see the iPad as a device to authorize it. Todo syncronization tab in settings has Appigo Sync as a service but it gives me a Passcode to use in Appigo Sync preferences with the iPad device but since I can't get the device recognized it is all in vain. There is no help or phone number to call for help. Their support page goes into using and changing settings in Airport but this is really not a friendly way for non experienced users. I do hope they come up with a solution since this program is really not ready for consumer use. Hopefully someone in support will see this comment and reply to me. 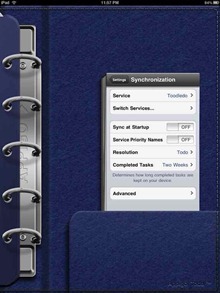 Hey Sandy – I just tried out the Appigo Sync stuff just in case I might be able to help. It works just fine for me. I know that doesn't help you. First question is are the iPad and your iMac both definitely on the same local WiFi network? Yes it can, and that is mentioned above in the app features list. That's a good option.